The reality is kids are dare devils they want to do everything that they can find and do it NOW! They don’t care that your two wheeled bike is for grown ups, to them it is just one more thing to conquer! Its really one of the things I love about kids, but it is also something that I worry about with kids. I recently found the fabulous Kinderfeets bike and I have to tell you, it is awesome for little kids. It is a push bike, similar to infant toys where they sit on it and move across the floor. The one difference about the bike is that it teaches kids to balance. They are not that high off the ground, yet high enough to pick their feet up and glide when they get moving. I love that they are made of wood and have a great retro look that keeps things a little higher quality in my opinion, it also gives the bike the look of a real bike. The bike itself is balanced well and on its own it does not drag to one side or the other. When the box came I was a little intimidated but, when I opened it up and started to put it together I found the instructions clear, concise and simple. Since I have had it together, she is hardly off it. More than a toy, Kinderfeets is a father’s gift to his son. Disappointed with the push bikes available, Dutch designer Oscar Mulder decided to create his own balance bike for his son, Sebastiaan. Oscar wanted Sebastiaan to be able to cruise once he became confident enough, so he broke the push bike mold and added footpegs. Knowing kids love to get dirty, he added a removable seat cover that can go in the wash with the rest of the laundry. Other push bikes have inflatable tires that go flat, interrupting the fun. 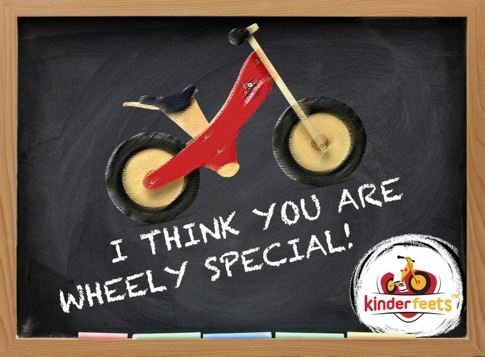 But Kinderfeets’ tires don’t require air. Plus, Kinderfeets’ colorful chalkboard finish provides a reusable canvas for children to exercise their creativity. Older now, Sebastiaan rides a regular bike with ease and confidence – all thanks to the push bike his father designed with him in mind. These are eco-friendly too! The balance bikes are made from sustainable birch wood, from a replenishable source. The airless tires are completely biodegradable. The chalkboard finish paint is water-based and the lacquer is non-toxic. And with Trees for the Future, Kinderfeets plants a tree for every bike we sell. This impresses me, I love when a company sees that we all have an impact and they are trying to minimize theirs. Kinderfeets is designed for children between the ages of 2 and 5, or as soon as they can reach the ground while sitting on the lowest seat position. The seat is easily adjustable so children of all sizes can ride, and ranges from 13 to 16 inches high. Kinderfeets is designed by a Dutch designer in California and hand made in China. There is a Native American proverb that cautions us to “treat the Earth well…we are borrowing it from our children.” When we set out to make Kinderfeets, we wanted to make an investment in out children’s future.